Would you ever open your fridge, pull out twenty plates of pasta and chuck them into the bin, and then, eat only one plate of food? How about leveling fifty-five square feet of rainforest for one lunch or dumping two-thousand-five-hundred gallons of water down the drain? Of course you wouldn't. However, just eating half a kilo of meat will cause this. Eating meat will cause inefficient use and destruction to our resources and environment, cause immense animal suffering, and have detrimental effects on our health. So, if roasting a dog to complement your mashed potato disturbs you, then why roast any other gentle animal? 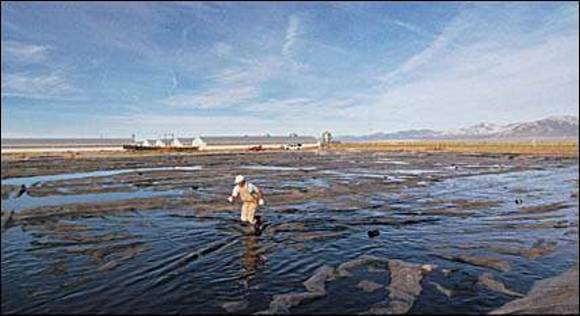 Circle Four Farms, a Utah-based pork producer, hosts a three-million gallon waste lagoon. When lagoons like this spill into rivers and lakes as happened in North Carolina in 1995, the result can be environmentally catastrophic. A UN report has identified that “cows not cars, are the top threat to our environment.” It gives evidence that the world's rapidly growing herds of cattle is the greatest threat to the climate, forests and wildlife. Farmed animals produce one-hundred-and-thirty times more excrement than the entire human population of the United States and this concentrated slop ends up polluting water, destroying top soil and contaminating our air. Furthermore, their bodily gas and manure emit more than one third of methane, which warms the world twenty times faster than carbon dioxide. Meat-eaters are responsible for the production of one hundred percent of these wastes which is about eighty-six-thousand pounds per second. But, by giving up animal products, you will be responsible for none of these. 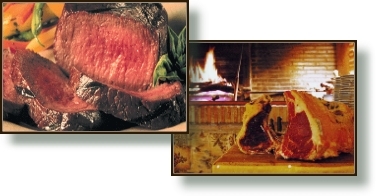 Moreover, our taste for meat is taking a toll on our supply of non-renewable resources. A staggering two-thousand-five-hundred gallons of water is needed for the production of each pound of beef, but, in contrast, it takes only twenty-nine gallons to produce a pound of tomatoes and a hundred-and-thirty-nine gallons for a pound of whole wheat bread. Half the water, eighty percent of agricultural land in the United States, almost all the soy bean harvest and over half of the world's grain is used to raise animals for food. While we are doing this, one billion people are suffering from hunger and malnutrition and twenty-four-thousand children die every day alongside fields of grain destined for the West's livestock. However, world starvation would be eliminated if our scarce resources were utilized efficiently by converting land to raising crops for feeding people. 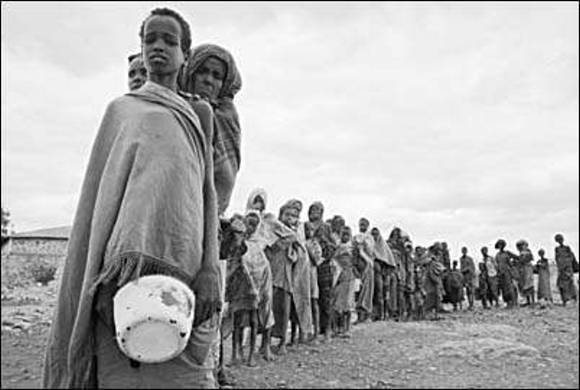 Somalian famine victims line up for food handouts. Producing a pound of beef requires 4.8 pounds of grain, and critics of our modern agricultural system say that the spread of meat-based diets aggravates world hunger. Are you aware that one-hundred-and-thirty million animals are murdered annually in New Zealand? Most animals are raised on factory farms, the system which strives to maximize output at minimum costs. As a result, the animals suffer immense pain mentally and physically every second of their lives. They are crammed into filthy windowless confinement systems and will never raise their families, rummage in the soil or do anything that is natural to them. They won't even feel the sun on their backs or breathe fresh air until the day they are loaded onto trucks, destined for slaughter. Over ninety million animals in New Zealand suffer these conditions and many remain conscious as their throats are cut, then, left to bleed to death. Another cruel practice farmers often carry out is the deprivation of food from birds for fourteen days in order to shock their bodies into laying more eggs for human consumption. And, because male chicks are useless in the meat industry, each year a hundred million of them are ground up alive or tossed into bags to suffocate. 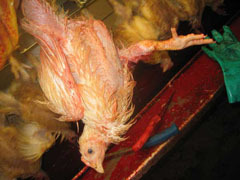 What's more, at the slaughter house, the chickens throats are cut, and they are immersed in scalding hot water to remove their feathers while many are still alive. Even nowadays, to mark cows for identification, ranchers push hot fire irons into their flesh as they bellow in pain. Consequently, third degree burns occur and male calves' testicles are ripped from their scrotums all without pain relief. To add to their suffering, the land which cattle graze on has air saturated with chemicals and these fumes cause chronic respiratory problems, therefore making breathing painful. Cows used for their milk are repeatedly impregnated and their babies taken away so that humans can drink the milk intended for the calves. They are hooked up to machines several times daily and using genetic manipulation, powerful hormones, and intensive milking, they are forced to produce ten times more milk as they naturally would. This contributes to the immensely painful inflammation of their udder which up to fifty percent of dairy cows suffer from. Animals on today's factory farms have no legal protection from cruelty that would be illegal if it were inflicted on household pets: neglect, mutilation, genetic manipulation, and drug programs that cause chronic pain and crippling and, violent slaughter. Robert Louis Stevenson, a novelist and poet said, “We consume the carcasses of creatures of like appetites, passions and organs with our own.” Yet, farmed animals are no less intelligent or capable of feeling pain than are the dogs and cats we cherish as companions. The most important step you can take to save our planet and diminish both human and animal suffering is to go vegetarian. A meat free diet rich in complex carbohydrates, protein, fiber, omega-three, vitamins and minerals provides optimal nutrition, forming the foundation for dietary habits that support a lifetime of good health. Compelling evidence can be found in the book “The China Study” by Professor T. Colin Campbell which says, “in the next ten years, one of the things you're bound to hear is that animal protein is one of the most toxic nutrients of all…risk for disease goes up dramatically when even a little animal protein is added to the diet.” Studies have shown that vegetarian kids have higher IQs than their classmates and vegetarians live, on average, six to ten years longer than meat-eaters. In addition to this, they are fifty percent less likely to develop heart disease and cancer, plus, meat eaters are nine times more likely to be obese than vegans are. Vegetarian foods provide us with all the nutrients we need, minus the saturated fat, cholesterol, and contaminants. Conversely, many argue that plants are alive too. This is true, but plants have only ten percent consciousness while animals have consciousness equivalent to humans. Since plants cannot locomote, the sensation of experiencing pain would be superfluous. Thus, plants differ completely physiologically from mammals. If you cut a branch or leaves off a tree, it will flourish and grow more. On the other hand, animals do not desire regular pruning. Can you cut off a leg from a cow and expect it to grow four more legs? Raising animals for food is wreaking havoc on Earth. The environment, resources and our health are deteriorating and although most of us do not actively condone killing, humans have developed the habit, supported by society, of eating meat without any real awareness of what is being done to the animals we eat. It is said that, “one visit to a slaughterhouse will make you a vegetarian for life. Because it is us who created their screams of pain and fear.” So, if you ever decide to roast a gentle animal again…remember you are consuming the flesh of one equivalent to your much loved pets. But, the only difference is that this animal was tortured. is the cost of just a few hamburgers! * The author is a 17-year-old student in her final year of secondary school. The article was an internal assessment for which she was awarded the top grade of excellence.